is Designed, Engineered, and Manufactured in the United States of America. Copyright © 1998, 2008,2009, 2010-2012, 2016 by David Jacks. All Rights Reserved. A significant breakthrough for PCB manufacturers was heralded at the 1997 Wescon Expo in Silicon Valley as Zephyrtronics -- long recognized as the pioneer in bottom-side convective heating systems -- introduced the world's first AirFountain® that solders and de-solders hundreds of thru-hole connectors pins simultaneously in less than a single minute! The patented ZT-6 AirFountain® multi-tasks eliminating labor-intensive jobs typical with soldering irons. Soldering Stackable Connectors like PC/104's, Samtec® 'Stackers' or IEH Hyperboloid stackable connectors is easy...even if you have gold pins. The AirFountain® is a great solution for secondary PCB operations of soldering thru-hole connectors, preheating giant PCB's or desoldering and removing of multi-pin connectors or pin grid arrays. Plus it is a cleaner and more consistent alternative to messy, awkward traditional solder fountains. What Is An AirFountain and How Does It Work? 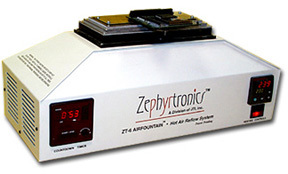 The AirFountain® provides simultaneous reflow to the connector/pad interface through its ESD-safe heated air supply where the temperature is tightly maintained by a digital microprocessor control. The Temperature Controlled Heated Air Propels from the AirFountain® below the PCB and is targeted directly to the leads of the connector from below making clean, non-contact reflow quick and repeatable. PCB Rework/Repair. Above: Rapid Connector Extraction. No Messy Solder Fountains or Pots! Forget about waiting hours to heat up. The AirFountain® eliminates that! Old fashioned solder fountains and solder pots are prone to spills and are just miserable to use. The AirFountain® quickly ramps to temp, requires no solder ingots and has its own internal air supply. The AirFountain® is clean soldering. Further, hand soldering with soldering irons fails with stackable connectors. Worse, they contaminate the gold pins, leads or tails on connectors. The AirFountain® has no such limitations. Because the AirFountain® is lightweight with its own air supply, it can be readily used at the production floor, a test lab, an engineer's desk, or in field PCB rework and repair. Remove Connectors In Second! The ZT-6 AirFountain® simultaneously reflows all pins or leads so technicians can extract a connector right out the PCB without fear of lifting pads. Even high-pin count connectors remove quickly as all the pins reflow quickly. What About Press Fit Stackables? NASA and most military regulations prohibit "press-fit" stackables as they are too unreliable. NASA requires soldering such connectors. The patented ZT-6 AirFountain® is your affordable, "non-press fit" high quality soldering solution. High Pin-Count Connectors: Any benchtop soldering of high pin count connectors with multiple rows of pins like PC/104, Samtec® 'Stackers' or IEH Hyperboloid stackables has previously been practically impossible. Because of this, many PCB manufacturers opted to use inferior "press-fit" connectors which have now been prohibited by the U.S. military and NASA as unreliable. But while soldered joints provide air-tight, robust electrical and mechanical connections, soldering irons with stackable connectors is almost impossible. Working With Gold Pins? The noble metal finish (typically gold) on both the plug and the receptacle must not be compromised with any solder deposits on the mating portion of the connector tails. Therefore, use of wave soldering, solder pots or solder fountains are out of the question for assembly. And the same applies to soldering irons which is explained next. Stop Inefficient Hand Soldering of your connectors in secondary, off-line operations. You can speed up your work, enhance solder joint quality and endthe frustration, too! What About Tight Spacing? The tight pitch between rows and the lengths of the contacts (.480") exacerbates hand soldering problems making the utility of a soldering iron difficult. It is impossible to get a soldering iron tip down inside those tight rows and not drip solder on the gold pins. See how the AirFountain® solders and desolders connectors. The AirFountain® ends the soldering iron bottleneck. Most connectors reflow within one minute. Hundreds of pins solder simultaneously with solder fill and fillets! Wow! AirFountain® & Pre-Forms! 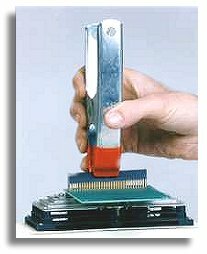 Yes, simultaneously solder hundreds of connector pins in less than one minute at your bench -- with high-quality solder joints with fillets on both top and bottom, exceeding the most stringent IPC Class 3 requirements. Your AirFountain® yields solder joints superior to those hand-soldered. See photo at the right. The Process? 1.) Use connectors preloaded with solder pre-forms or add solder do-nuts to the pins; 2) Insert connector into the board, and 3) Place the assembly onto the AirFountain® and let the soldering begin! Secondary Soldering Operations: Soldering PCB assemblies with stubborn connectors can continue at high volume production rates even if off-line soldering is required for thru-hole connectors. Again, the AirFountain® is not limited to connector soldering, but is a magnificent preheater and all around production assist at the bench with R&D and design groups, rework technicians, desoldering and preheating applications. It is an essential tool with military and defense contractors and aerospace® companies for tough PCB challenges where high reliability is a must. 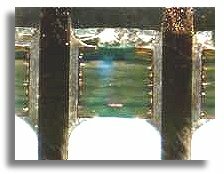 Cross Section Reveals the High Quality Solder Joint Generated by the AirFountain®. 100% Solder Fill With Top & Bottom Side Fillets. Exceeds IPC Class 3 Requirements. Any electronics catalog of soldering equipment, tools and products today reflects David's long and enduring influence on the printed circuit board industry world-wide. Now in his old age, David's keen interests is in encouraging inventors and designers to "stick with it" and never to surrender their dreams, and to "make the impossible possible" through science and technology. David Jacks was Director of Engineering at three Fortune 500 corporations along with the two largest soldering equipment manufacturers on earth for 13 years before launching Zephyrtronics in 1994 with fellow engineer, Randy Walston. David's professional design career stretches from the early 1970's. His original products have been spotlighted in feature articles in both Popular Science® and Popular Mechanics® magazines and have ranged from commercial coffee brewers and radio frequency controlled residential garage door openers to hobby glue guns, professional heat gun paint strippers and sophisticated industrial soldering equipment. He has designed products, tools and appliances marketed by Sears®, Black & Decker®, RadioShack®, Motorola®, Stanley Tools, Snap-On Tools®, Rubbermaid®, CooperTools®, Weller®, Hakko®, Ungar®, Farmer Brothers® and Brewmatic®. ©1996 - 2011, 2012, 2013, 2014-2016, 2017-2018, 2019 by Zephyrtronics®. All rights reserved. The information, text, images, photographs, charts, graphs you receive online from Zephyrtronics® are protected by the copyright laws of the United States. The copyright laws prohibit any copying, redistributing, retransmitting, or repurposing of any copyright-protected material. Zephyrtronics is the registered trademark property of JTI, Inc. "The Science of Zephyrtronics" and "Simplicity Through Innovation" and "Zephlux" and "ZeroLead" and "Zero Balling" and "Zero Residue" and "Post Cooling" and "Post Cooler" and "AirBath" and "SolderGlide" and "SolderMill" and "Just So Superior" are the protected trademark property of JTI, Inc. "Zephyrtronics" and "Low Melt" and "Air Fountain" and "Fountainhead" are the registered trademark properties of JTI Inc. *The above names are the registered property of their respective owners.